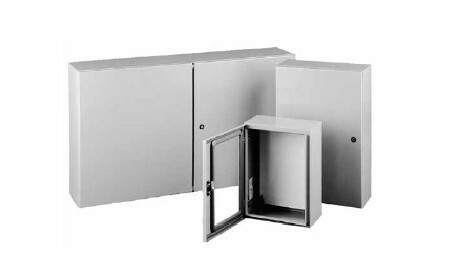 Hoffman Wall-Mount Concept Enclosures Type 4 and 12 are ideal for machine control applications. With streamlined styling, flush quarter-turn latches and an attractive, durable finish. Available in solid or window single-door and two-door landscape, flush-mount and sloped-top versions for application and mounting flexibility. Two-door landscape models provide full-width access and easy panel installation. Door alignment device on doors wider than 30 in. Wall-Mount Concept Enclosures have two standard finishes are available: ANSI 61 gray or RAL 7035 textured light-gray polyester powder paint inside and out. Hoffman Wall-Mount Concept Enclosures accessories include Door Stop Kit. Handles, Lock Inserts, CONCEPT Panels and Mounting-Bracket Kits. Download the Concept Wall-Mount Enclosures spec sheet below or call 714.835.6211 for more information.